Imagine a morning, you snoozed your alarm couple of times and for some odd reason it failed to go off again. You wake up well past your usual time and have nothing ready to prepare breakfast. The kids are also in a sleepy mode and whine at the idea of plain bread toast for breakfast. I’m sure most of you can relate to this. Being the super health conscious mom, I try to keep homemade peanut butter in the pantry. It comes in handy in these situations and gives a perfect kick start to a busy day. Once you try it at home, I am sure you will never go back to the store bought version for three reasons. 1. It is extremely easy and 2. It is super tasty and 3. It has absolutely zero preservatives, additives or added flavours. Blend everything in a mixer or blender until smooth. If you like your peanut butter chunky, keep aside half a cup of peanuts before blending. You can add this at the end and blend for just a few seconds. If you don’t get roasted peanuts in a store near you, you can roast them yourself by spreading on a plate and microwaving on high for approximately 5 minutes. 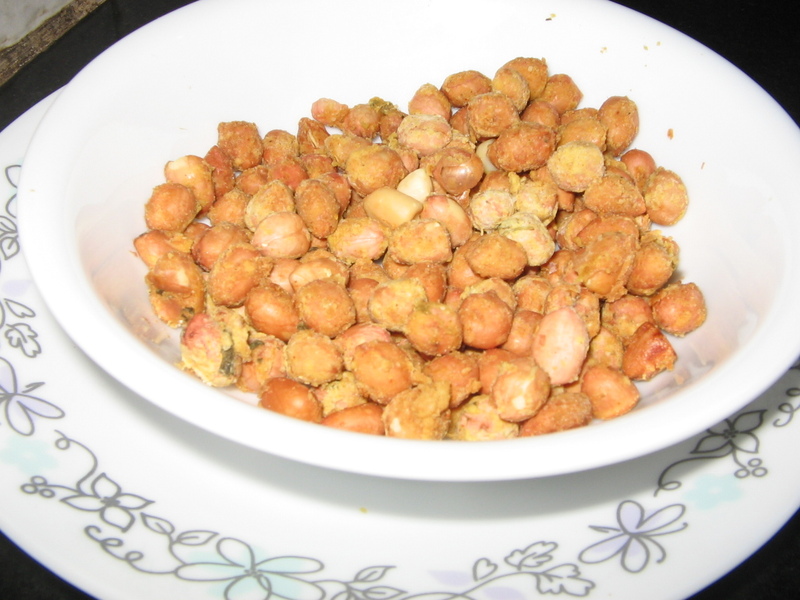 Peanut, also known as groundnut, is one of the healthiest foods. Peanuts are a good source of vitamin E, manganese, niacin and folate. They are also rich in protein and monounsaturated fats. This kind of fat makes it a great food for heart health. Among a host of other health benefits, peanuts offer an excellent source of resveratrol, a polyphenolic antioxidant which helps in cancer prevention, reduced risk of stroke and Alzheimer’s disease. So, what’s stopping you? Go indulge yourself with a handful of peanuts. How to Buy Look for a fresh pack which has been stored in clean, moisture free environment. Check if the nuts are whole and are not cracked. Storage Store in a cool, airtight container. Peanuts can be refrigerated for longer shelf life. 4 pm is tea time, or snack time, in most homes. But for us, it is fruit time. Because, exactly at 4 in the evening, we (mostly D & D) will be peeling the bananas?! Initially, they used to wail and hate the very thought of eating fruits. But, they have now got so used to it that little D, if not given a fruit at that time, comes and asks me “where are the fruits”? Such nice kids have to be rewarded, don’t they? What can the reward be? Anything that is crunchy and great to munch on… Just for the sake of getting their hands on the snack they will finish their fruits faster. I saw the recipe on a website and tweaked it, and voila! It turned out just right! A quick snack that is tasty, healthy, and nutritious. Perfect for me as well as for the kids. 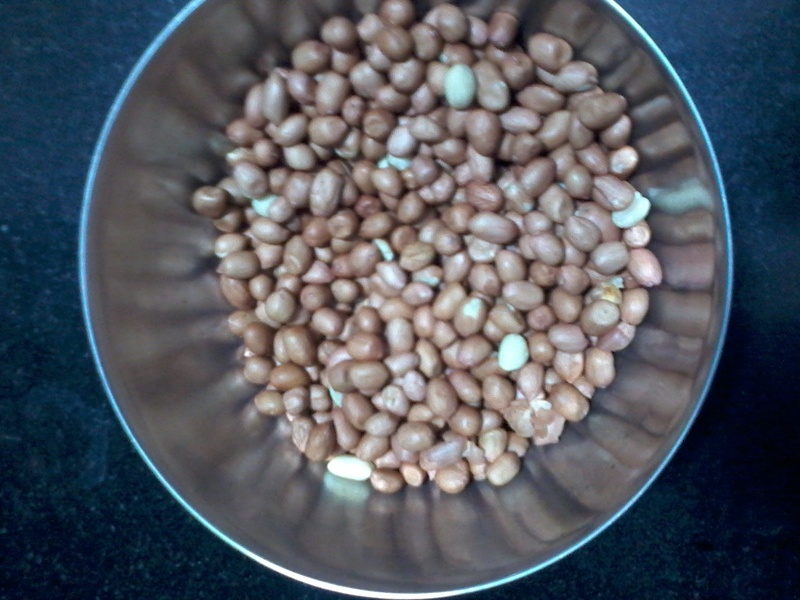 Take the peanuts in a bowl, and add all the powders, masala, ginger garlic paste, kasuri methi, oil and salt. Sprinkle water lightly and mix well. 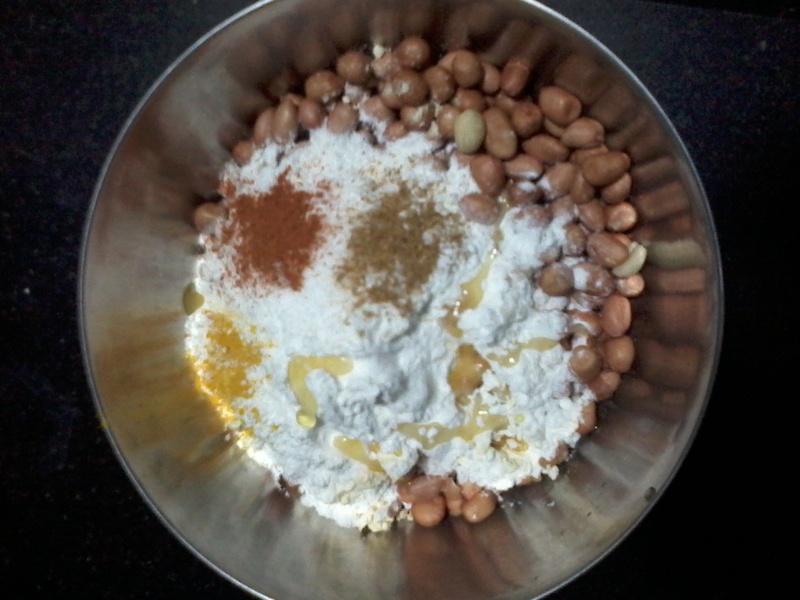 Add besan and rice flour to this so that they just coat the peanuts. For people who don’t like such intense flavours, its best to omit the spice powders except salt and a pinch of chilli powder and go ahead with the recipe as it is. Spread it out on a greased microwaveable plate and set microwave on high for 3 minutes. 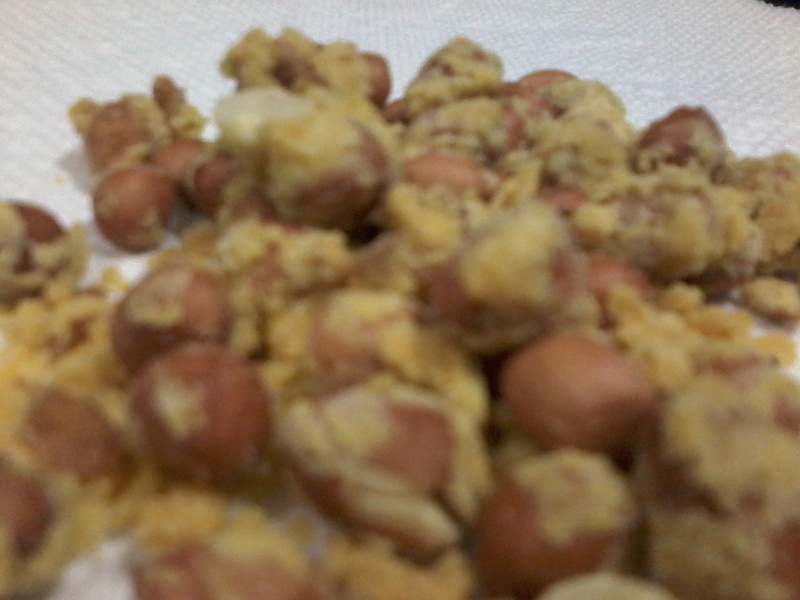 Mix well (you might want to seperate the nuts which are sticking together) and microwave again for 2-3 minutes. You can check if it is done and if needed put it back in the microwave for a few more minutes as required. To check if the peanuts are done, you have to wait until they are cool. 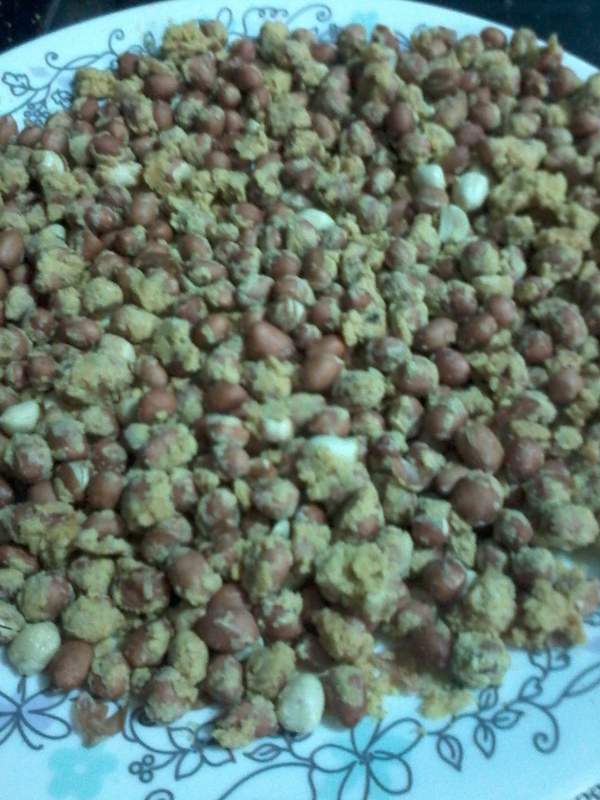 Tasty and crunchy masala peanuts are right here on the table. Gonna grab some before it gets over. Promoting healthy eating is rather easy with this recipe (or so I feel). Do let me know how it turns out for you.